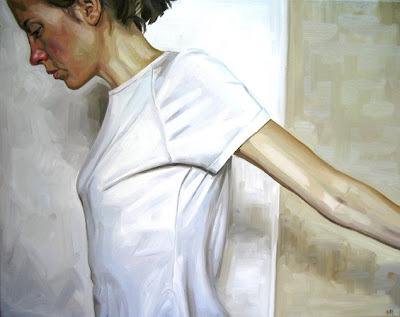 Heather's Paintings and Musings: "Anxiety Is The Hand Maiden To Creativity"
"Anxiety Is The Hand Maiden To Creativity"
Recently I was asked to illustrate an article by the author and essayist William Styron, who passed away in 2006. The assignment could not have come at a more appropriate time. Styron wrote about his personal experience with clinical depression so eloquently in his book "Darkness Visible". It made a huge impression on me, as I have suffered periodic bouts with depression and anxiety over my lifetime. I am honored to do this illustration, which is for a dog magazine called "The Bark". Keep an eye out for it on your local book stand in the future. It will be a portrait of a man walking his dog, simple enough, but hopefully it will have some weight given the wonderful text next to it. There is still a lot of stigma attached to mental illness. I suppose it is rote to expect an artist to suffer some sort of psychological affliction if they are to get anything of substance accomplished. I have not asked many of my colleagues but I would bet that the incidence of depression and anxiety is no larger in them than in the general population. Of course this is pure supposition, but my own experience with depression and anxiety is acutely real. I write about my own history with inner turmoil here because I think writing and sharing is cathartic. It gives one a sense of lightness to discuss what ails you. Perhaps some readers can identify with me. In terms of its connection to creativity, many would argue as T.S. Eliot does that "anxiety is the hand maiden to creativity". I do think that anxiety can be helpful in that you tend to get things done simply out of a nervous freneticism, but when it reaches its zenith you suffer and are literally frozen by your worries. Personally I find that when anxiety reaches this point I literally cannot paint. My mind sabotages my entire being and I am quite helpless until I figure out a way to overcome the situation. It is a battle, and I wish desperately that I did not have anxiety but I do think we are hardwired psychologically to a large extent. I know that there has been a hereditary link drawn with depression for example. So the question is: how to prevail over it? Thus, if our minds are to a large extent as unique as our fingerprints, and as intractable, we really have to get creative if we want to overcome what haunts us. Exercise is my mental panacea. It distracts me. That is imperative with anxiety. I talk to friends; I take myself out of isolation, because that is where it really gets a grip on you, when you are alone. You can see a pattern here as, being an artist, I spend a heck of a lot of time alone. Ironically too, I cherish my solitary time, but this is the price I pay. I have created some artwork while in the midst of turmoil. Two pieces are included below as examples. However, most of my work is not as overt, the inner strife is hidden behind the faces of my subjects, myself included. I do this because as I have said before, I want the viewer to wonder, to not have answers provided. 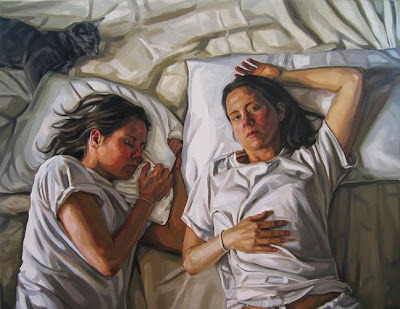 Therefore they have to instill their own individual experience into the painting by providing personal context. 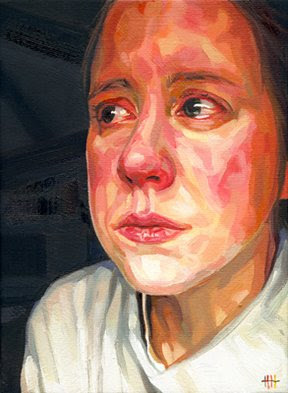 "Self-Portrait, Between", 2005, oil on canvas, 16"x20"
With anxiety and depression the key is to get on top of the circular thinking, the what-if scenarios, and stop the thoughts in their tracks so that I can get on with doing what I love to do: creating art. I realize that I will probably always struggle with anxiety, and depression to a lesser degree. If it must be however, I will equip myself with the strongest tools possible to get through it. Tireless support from loved ones is invaluable. Thank-you. You know who you are. I suppose I should be thankful and embrace these trials of the mind really. They are who I am, and I wouldn't want to be anyone else. 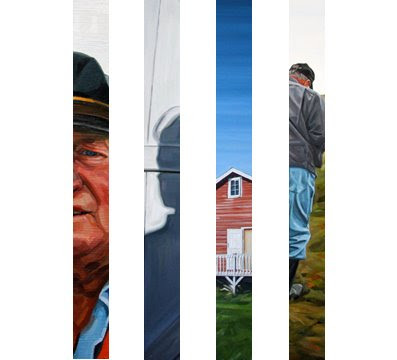 Here are some snippets of paintings that will appear in my solo show on Newfoundland in November at Abbozzo Gallery in Oakville, Ontario. I am working steadily on new pieces each day. It will be an exciting show! You can find out more information about the exhibition on my website here. One of the paintings has already sold and the show is still 10 months away! If you are interested in seeing the pieces please contact Abbozzo Gallery. On another note, Bravo! Canada filmed a special profiling my work in 2007. It will be airing on Bravo! Channel all across Canada on Monday, February 9th at 8:30am Eastern Standard Time. I hope you are able to catch it! It is on at an odd time but thank goodness for PVRs. Hi Heather. This blog entry spoke to me. I kind of committed to painting nine self portraits for a gallery I work with. The last time I did a painting of myself it scared me. It showed the depressed, beat up side of me that most people do not see. It is the depressed side that I would rather ignore. I am thinking that this series of portraits might be good for me but I am having a tough time getting started. Thanks for your writing. written by means of him as nobody else realize such precise about my difficulty.